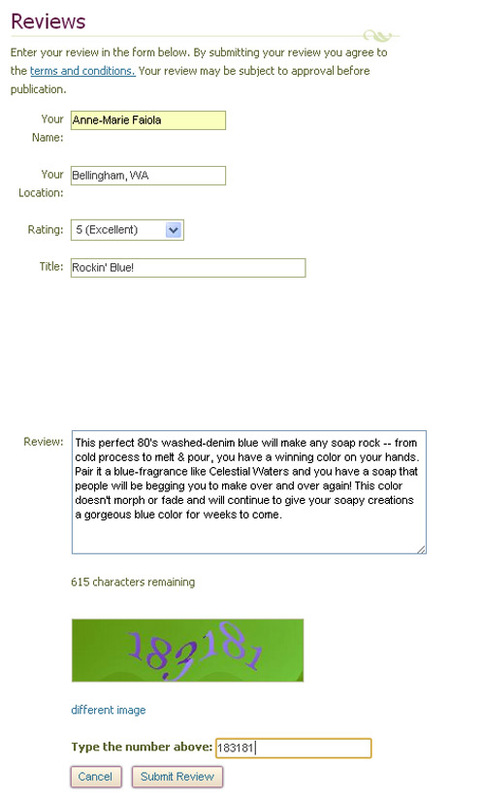 Bramble Berry Feature ~ How to Leave a Review! Based on your suggestions, comments and encouragement we have been working hard to get a system on Bramble Berry’s website where you can review our products and leave feedback. We’re happy to announce that we have a review system finally in place! We want to know what you like, what you don’t like and any additions you’d like to see to the Bramble Berry product family. Follow along to learn how to leave your very first review. ONE: Sign into your Bramble Berry account. In order to leave any sort of product review, you will have to be signed in! 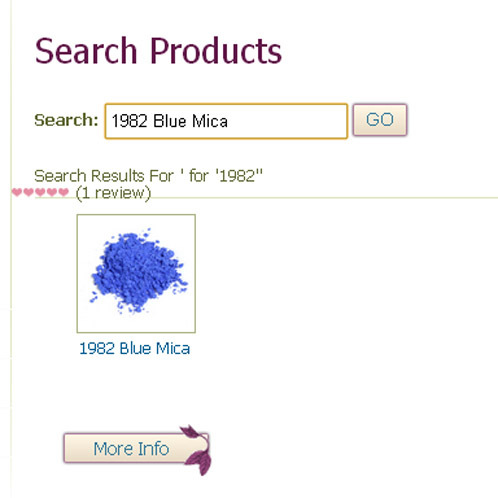 Use the search function or menu bar to select the product you would like to review. For the ease of this quick tutorial, I am picking the ultra-fun 1982 Blue Mica. 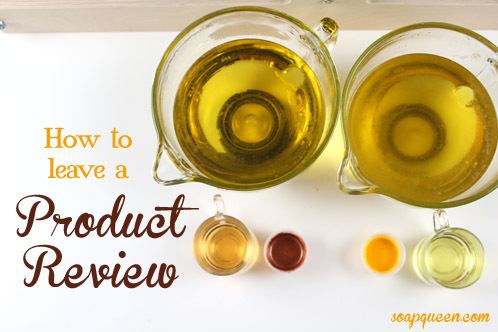 Did you know that you can tell if a product has been reviewed without even clicking on it? 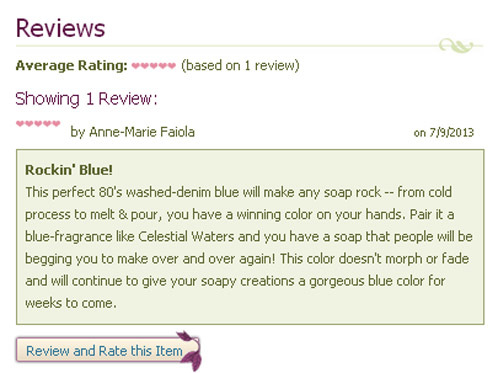 If you search for an item and see those cute little hearts, you will know that a review has been left on that product! 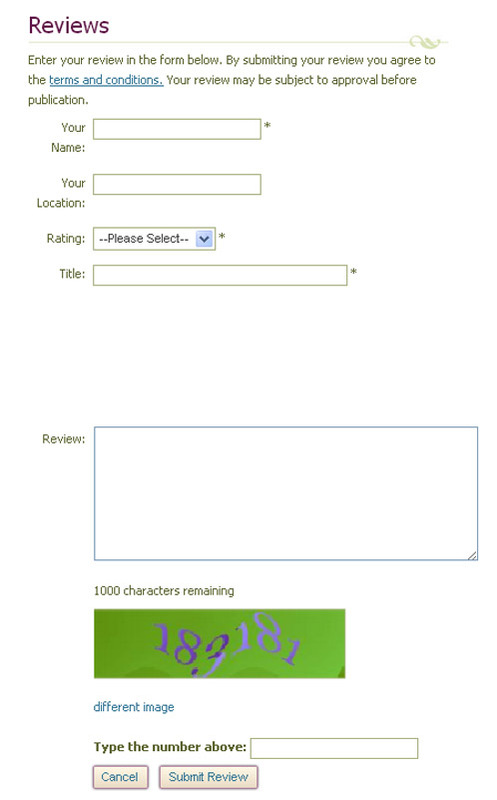 THREE: Once you’ve clicked on the Review button, you’ll see a screen that looks like a blank form. Fill out all of the spaces in the form and make sure to let us know why you like that particular product so much (or even why it didn’t quite work for you — feedback is important!). After you’ve finished writing your review (remember, you only have a 1000 character limit! ), click the ‘Submit Review’ button. If you have a product that you’ve been dying to tell everyone about, or just want to let us know how something worked for you, we would love to hear about it. Our research and development team is always hard at work testing and re-testing all of our products to make sure they are well-represented on our website. We want to make sure and have the very best soapmaking supplies available. If you have a concern or a comment about any of our products, please let us know and we will look into it! Thank you for the prompt orders received! I loved the woodland eves oil. I love input from other soapers, so thank you for doing this! I will do my part and leave reviews for you as well. Question for you… Is there any chance of a ‘reward’ for leaving reviews? Some other sites offer a coupon for reordering a reviewed product, or a few cents off your next order for reviews that you can have add up after a while to use. So is there a chance that there might be a system like this in the future, if there is not already?